Summary Single bay NAS powered by dual-core Marvell SoC with single Gigabit Ethernet and two USB 2.0 ports. Single-bay NASes make up a very small part of the NAS market. 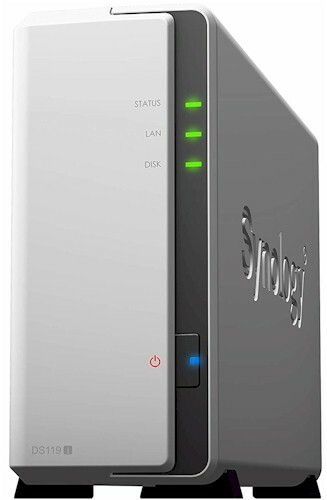 Looking at our NAS charts and filtering for a single drive, you'll only find three products including the latest entry, the Synology DS119j. For those of you who follow Synology's naming conventions, you know that the "j" suffix on a model number means that it's part of their entry-level NAS family. With an MSRP a penny shy of $100, it is the least expensive single-bay NAS that you can buy. Since there are only three single-bay NASes in our charts, I'm going to include both the previously reviewed Synology DS118 and the QNAP TS-128A in our comparisons throughout the review. The chart below, generated from the NAS Charts, shows the basic differences between the three NASes. If you want to see a complete comparison, click here. The DS118 and the TS-128A have similar hardware platforms. Both are powered by a quad-core Realtek SOC clocked at 1.4 GHz and have 1GB of RAM. The DS119j has a significantly less powerful hardware lineup with a dual-core Marvell SoC clocked at 800 MHz and only 256 MB of RAM. The DS119j lacks USB 3.0 ports but has two USB 2.0 ports. The chart below shows the comparison of the number of ports but both other NASes have at least one USB 3.0 port, which will result in better backup scores. All three NASes require case disassembly to install/change drives. Worthy of note - the installation of drives into the TS-128A, as well as the case disassembly, does not require tools. The callout chart below shows the front and rear panel layouts. The rear panel has two USB 2.0 ports and the single Gigabit LAN port. The front panel has a Status LED, a LAN LED indicator, and a LED for the single drive. The image below shows the top side of the board for the DS119j. The Marvell SoC is marked by a skewed square. Note that it has no heatsink. The table below shows the key component summary for the three NASes. As noted in the introduction, the DS119j has a dual-core Marvell processor while the other two have quad-core Realtek processors. The Synology DS119j drew 9 W with one of our stock WD Red 1 TB (WD10EFRX) drives spun up and 3 W in power save mode with the drive spun down. Fan and drive noise were rated very low.